The PROSpike police stinger was developed from the idea that the user must be able to deploy the stinger without the risk of getting injured. The PROSpike police stinger is activated by a remote control up to a maximum distance of 100 meters, thus ensuring a safe distance between the operator and the vehicle. 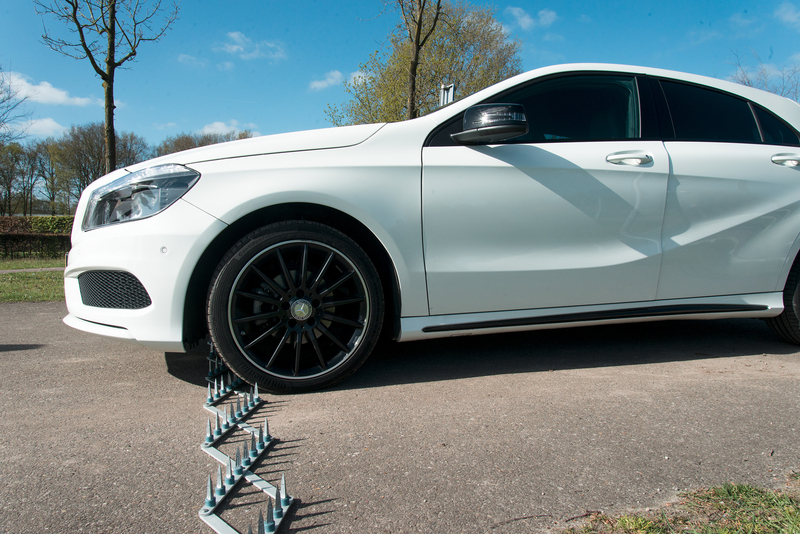 The five models of the PROSpike police stinger are recently CE-certified by TüV Nederland QA. All PROSpike units comply with environmental and occupational guidelines. With a weight of only 22.5-23 kilograms, the PROSpike police stinger can be lifted by any user, in and out of a vehicle, without additional lifting tools. The PROSpike police stinger can be used in various situations and circumstances. The central processor communicates with the remote, but can also be linked to CCTV or ANPR systems. This unique feature also makes the PROSpike police stinger extremely suitable for preventive deployment in access roads or locations with strict admission requirements. The PROSpike police stinger is a new and innovative vehicle-stop system that distinguishes itself from other police stingers with an unmatched efficiency and safety for the end users. The PROSpike police stinger is software engineered and can be activated by the use of a remote control thus ensuring the safety of police officers, military personnel, and other end users The police stinger applies to several working environments. It can be used for traffic control, border control, roadblocks or stopping fleeing suspects. The heart of the PROSpike police stinger is represented by the Central Processor Unit (CPU) and an intelligent battery. The remote control communicates directly with the CPU and continuously provides the user with system status information: battery capacity, pressure and possible disturbances are directly displayed on the LCD screen of the remote control. In addition, information on the LCD screen tells the user when the remote control is positioned out of range of the CPU. The service interval is monitored software-wise and displayed on the remote control's LCD screen. The PROSpike police stinger is frequently subjected to field tests, duration tests and drop tests. Based on these tests, a software based maintenance schedule was submitted. The remote control automatically warns the user when maintenance is required. On a daily basis the PROSpike needs little maintenance: it suffices to remove mud and sand after use and slightly lubricate the moving parts with oil or silicone spray. The warranty on PROSpike police stingers is 24 months provided that regular maintenance is performed. A PROSpike police stinger has 96 hollow spikes attached to aluminium scissors with a rubber cup. When a vehicle drives over the scissors, the nails pierce one or more tires and thus they are pulled out of their rubber cups. The nails perforate the tires so that they are deflated. Dependent on the type of vehicle and the vehicle speed, the tires are - in most cases - completely empty within 200 metres. The nails can be easily replaced by the user. The PROSpike police stinger comes standard with 10 extra nails and corresponding rubber sleeves. Naturally, the nails and rubber sleeves are orderable.